The members of Poppin'Party are shining on the Weiss Schwarz English Edition stage for the BanG Dream! Booster Pack! 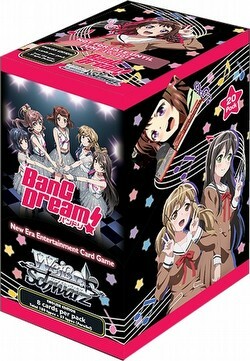 Join the search for the Star Beat with Kasumi and friends! 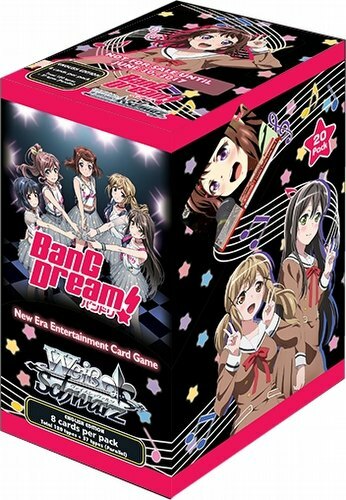 Look for 10 different exclusive SP Gold Foil/Hot Stamp signed cards from the Japanese voice cast randomly inserted in packs (Kasumi Toyama : Aimi, Tae Hanazono : Sae Otsuka, Rimi Ushigome : Rimi Nishimoto, Saya Yamabuki : Ayaka Ohashi, Arisa Ichigaya : Ayasa Ito, Yuri Ushigome : Suzuko Mimori, Nanana Wanibe : Mikoi Sasaki, Rii Uzawa : Izumi Kitta, Hinako Nijikki : Sora Tokui, and Asuka Toyama : Yuka Ozaki). There are 120 different cards in the set, plus 27 parallels and 10 special cards.